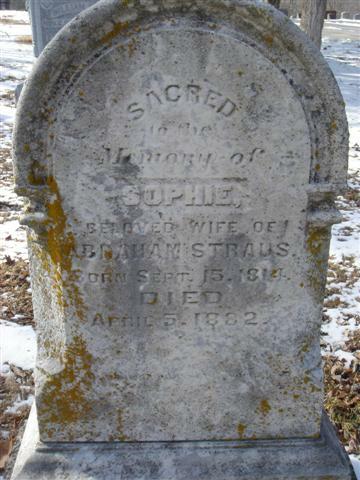 Joseph Straus, superintendent of the saddlery establishment of which he and his brother are proprietors, was born in Baden, Germany, in January, 1840, his parents being A. and Rachel (Hahn) Straus, also of Baden. The family came to America in 1869, and after remaining in New York a short time removed to St. Louis, thence to Jefferson City after a few years, and here the father died February 26, 1889, his death being preceded by the mother’s by several years. Only three of their eight children are now living: Mrs. Rowthine, Jacob and Joseph. The latter received a portion of his education in Germany, and completed his education in St. Louis. In 1853 he sailed for America, landing at New Orleans, and after a residence of one year in that city came to Jefferson. City, where he began working at the saddler’s trade, and after thoroughly learning the details of the work he and his brother Jacob embarked in their present enterprise, which has proved a decided success. They employ about 200 men, and nearly all their goods are shipped to St. Louis. History of Cole, Moniteau, Morgan, Benton, Miller, Maries, and Osage Counties, Missouri, Goodspeed Publishing Company (1889). 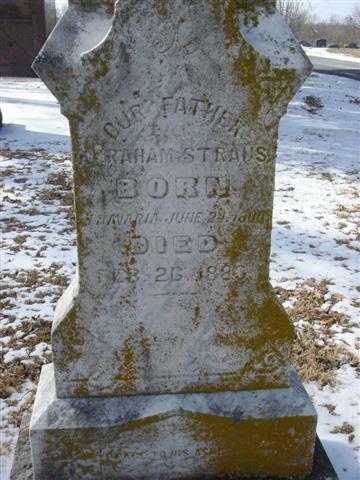 Abraham Straus was the father of Joseph and Jacob and died on February 26, 1889 at the age of 89. He is buried at Riverview Cemetery in Jefferson City.